1. Depart from General Hertzog Street heading North for 0.19km. 2. Turn left onto General Botha Street for 0.10km. 3. Continue straight ahead onto Rutherford Boulevard for 1.01km. 4. Turn right onto Faraday Boulevard for 0.26km. 5. Continue straight ahead onto Curie Boulevard for 2.00km. 6. Continue straight ahead onto R57 Main Route for 2.23km. 7. Turn right onto R553 Road for 6.43km. 8. Turn right onto R28 Main Route for 0.63km. 1. Depart from Houtkop Road for 6.44km. 2. Turn right onto R28 Main Route for 6.08km. 3. Turn right onto Gravel Street for 0.78km. 1. Depart N12 Freeway heading South bound. 2. Continue straight ahead onto N1 Freeway for 2.59km. 3. Turn left onto Golden Highway for 0.77km. 4. Turn right onto N1 Freeway for 0.03km. 5. Turn Sharply right onto Golden Highway for 0.23km. 6. Continue straight ahead onto N1 Freeway for 0.05km. 7. Turn right onto N1 Freeway for 32.34km. 8. 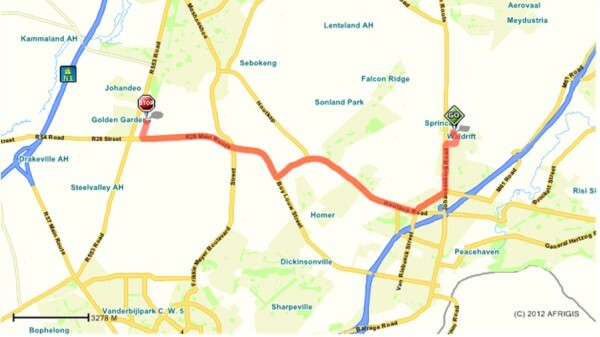 Continue straight ahead onto Randfontein Road for 3.32km. 9. Turn right onto R553 Road for 7.07km.